This one time at Summer Mummers, I ran into Jenny Lawson, aka The Bloggess. Despite the fact that I fangirlled like an idiot a little bit, she was lovely. And sweet. And funny. Everything about her was just...RIGHT. She even let me take a picture. Somehow, Victor managed to get into the picture. That's all it took for me to know that Victor is WRONG. 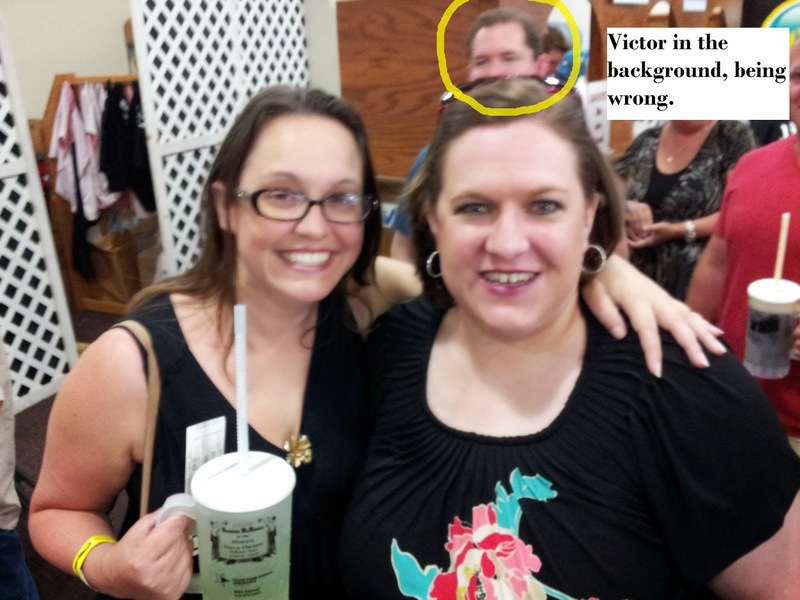 I feel the waves of wrongness emanating from Victor just from this picture. Waves of wrongness. I couldn't have said it better. Although I do feel just a smidge guilty about calling out Victor since he was cool about me temporarily monopolizing his wife. He may be wrong, but he's still good people. I left a comment but google ate it when I signed in. I blame Victor. If Victor has that power over Google, I will never trust Google search again...Since Victor is wrong and all. Thanks for stopping by. Reading your blog encouraged me to start this blog, and to drink more wine. You're a damn inspiration. I understand completely. I would feel the same if the tables were turned. If we ever meet, we'll probably be fast friends.